The DNV-5 is a Beta SX format dockable VTR. Beta SX is a digital format developed primarily for ENG professionals. Because the format is based upon the MPEG2 standard, it is easily integrated to nonlinear edit environments. And because Beta SX is digitally sampled 4:2:2, quality remains intact generation after generation. Internal Light System An optional Anton Bauer Ultralight* can be connected to the DNV-5 and powered by its internal power supply. On/Off can be synchronized with the REC Start/Stop function of the VTR. 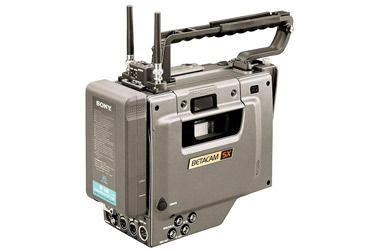 *Anton Bauer products may not be available in some countries.Versatile Camera Adapter The optional CA-701 provides the DNV-5 with output capacity for SDI (Serial Digital interface) signals as well as 4-channel audio input.Uses Betacam SP Tapes Use of conventional analog Betacam metal particle tapes assures media availability.Shot Data Recording Capability The DNV-5 can record data on tape to speed the search process: Date, Time, Camera ID, Cassette Number, and Shot Number can all be recorded according to the user's needs.Good Shot Marker & REC Start Marker Recording with the DNV-5 allows Good Shot and REC Start Markers to be placed on tape to speed the edit search process. These markers appear as picture stamps on the GUI of the DNE-50 Portable Editor during editing with the DNW-A100 Hybrid Recorder, for to Slot Wireless Receiver The optional WRR-855A Slot-in Wireless Receiver can be loaded in the DNV-5, further reducing the size and weight of the equipment needed in the field.